Well, it seems this prequel series is already at an end. I've got to say that I am a bit unimpressed by it. I almost don't see the need to review it, but I suppose I might as well. It's not that this short prequel series wasn't good at any point, but it really wasn't all that necessary. The story wasn't anywhere close to being as riveting as the main story. It also doesn't do much to make Levi or Erwin any more or less important to me. 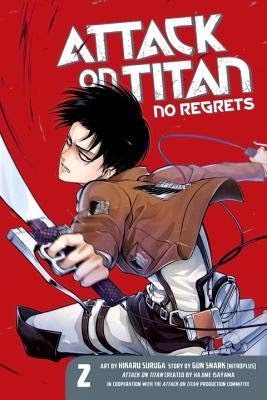 In this entry we continue to follow Levi, Furlan, and Isabel as they adjust to life in the Survey Corps, but there appears to be an ulterior motive to Levi's group. Nicholas Lovof has hired them to steal certain documents from Captain Erwin and if Erwin gets killed in the process... Well, hey, that's fine and good, too. Not only do I think this short prequel series is kind of pointless, I also saw through it completely. Furlan and Isabel do indeed get wasted by the titans. It could have been a little sad, but I saw it coming from the second they were introduced. It is neat that we get to see a bit of of Levi's previous life as a thug living in the underground, but I felt that his past could have been dressed up just a bit more. Levi seems kind of like a restrained psychopath albeit one with a strong sense of duty. It would have been nice to have seen him be a bit more brutal in his early days. Not just against the titans, either. The primary series is known for being a bit gutsy and violent, but this series plays it a bit safe and that is a bit of a disappointment. I mean, it's one thing when a story tries to stand on its own two feet, but this little series felt more like a tribute Isayama's work than an extension of the work. So it's kind of like a reboot of the earlier chapters of the series. Only instead of Eren learning the ropes of the Survey Corps, it's Levi. Put this in the "Meh, it's okay, I guess," category.